Buy 2 or more for only 27.99 each with Free Shipping!! 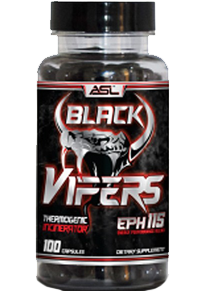 Free shipping on Anabolic Science Labs Black Vipers! Buy 2 for only 27.99 each! Promotes Mental Alertness & Helps Enhance Mood! Caffeine Anhydrous, Black Tea Leaf Extract, Green Coffee, Bitter Orange, Coleus Root Extract, Guggulsterone Z&E, Black Pepper Fruit Extract, Rawolsine. Other Ingredients: Capsule Gelatin, Titanium Dioxide, Magnesium Stearate.